i have been craving to eat here for quite some time now and there is one thing that i want to talk about and only this. i did not have my camera with me....blasphemy! but i did have my phone, so i took the best pictures i possibly could. 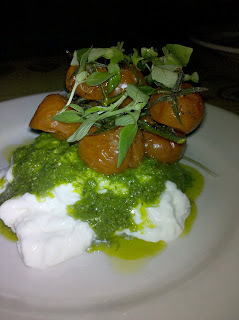 its their burrata, roasted cherry tomatoes on the vine with pesto. i love how the tomatoes were still on the vine! doesn't this look so mouth watering?! oh my God...just looking at it makes me wish i could reach out and just take a forkful of it and pluck one of the tomatoes off and pop it in my mouth! before i give my full review on this dish i will need to show you the accompaniment. our waiter suggested we order the side of garlic bread to eat with the burrata...so of course, i got it. i feel like this picture just does not do it justice. 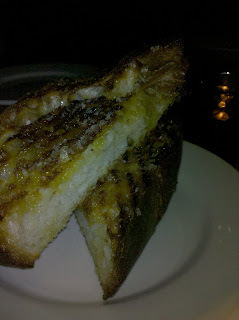 i swear, when this bread came out it really looked like a giant hunk of italian bread that was just slathered in oil, butter and lots of garlic and just toasted off! ok...so, if you have never had burrata cheese, its basically fresh mozzarella with cream inside of it. http://en.wikipedia.org/wiki/Burrata here's the link in case you want to read more about it. 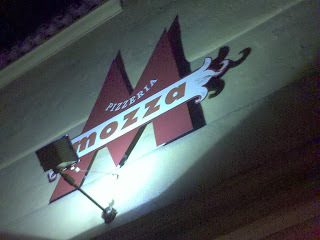 i love cheese and if you do too and haven't had burrata yet...you must go try it. all i can tell each of you is that...this was hands down one of the most delicious things i have eaten in a very long time. each component of the dish was THE perfect element, balancing out one another. and what i love is that they are just simple things but put together perfectly. i will say, i wish i had more of those little tomatoes, but isn't that what is so genius about what they did? give just enough to make you wish there was more, but because there is only so much, it makes you truly appreciate what you had. seriously...i couldn't get over how excited this dish made me...for weeks!!! i kept thinking about ripping off a piece of the garlic bread dipped in that buttery burrata with pesto, then shoving it in my mouth...followed up quickly with a tomato so that i could get that perfect bite all at once. good Lord...i wish i could snack on that now! what's totally disgusting is that i'm completely full right now too! but that's how much i love it!! if you ever get the chance, please please PLEASE! do yourself a favor and stop by pizzeria mozza and get this burrata appetizer...and don't forget the side of garlic bread. Sounds very tasty! I have eaten there and the place is great! it was! =) glad you enjoyed the food there! sugarFISH - bomb @ss sushi!